Posted by dutchgrub	on Friday, January 23, 2009 at 10:12. 3 Comments. Update: Kek closed doors in late July 2011. A sign on the window says that a new restaurant called “Doordagt” will open in late August. 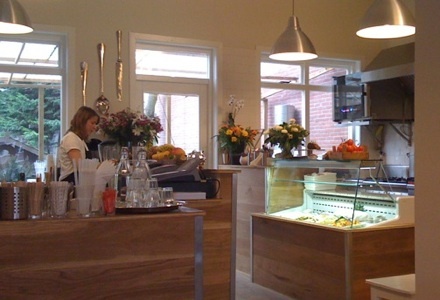 Hoofddorpplein has a new organic lunch place with free wireless. kek – short for “kant en klaar” or ready to eat – opened doors in January and has frequently looked busy! Hoofddorpplein is a square with shops and restaurants in a working class neighborhood just past the far end of Vondelpark. It won’t make it to the top of Amsterdam tourist sights. But it does have a number of interesting food stores and restaurants including well-known wine store Ton Overmars, recently opened Italian wine dealer Vino di Pino, eetcafe Gent aan de Schinkel, a kitchen store, an organic food store and now kek. The interior of kek was completely redone. The owners turned what used to be a gift store into a modern and bright lunch location. The design signals healthy and the furniture is simple with a lot of wood and country style folding tables. There is a long bench along the side wall that nicely connects the small tables. Owners Piet Hein and Frederique run kek and create a very friendly atmosphere. When I visited for the first time, Frederique found time to sit down and explain the menu choices and Piet Hein appeared from the kitchen to personally deliver the food. Other guests, including the owner’s parents, shared their positive thoughts about the food and decor. The food is simple but good. The sandwiches are made from fresh ingredients on thick slices of dark bread. While not masterpieces, a nice step up from the all too frequent bread and cheese. kek also serves simple dishes such as soups and pasta. All dishes are available in the restaurants and also to go – hence the name “kant en klaar”. Besides the welcoming service, my highlights were the house wine and the free wireless. The wine is provided by Ton Overmars – a nice touch to help your neighboors. And the bright and open design combined with free wireless makes Kek an ideal destination for checking email or writing a blog post while enjoying lunch. Filed under amsterdam, food, lunch, sights, wine. Took your recommendation and checked out kek for lunch today. In a word, fantastic! Great food, great service (you know how surprising that can be sometimes! ), great wine – and great prices! Two entrees and two drinks each, and we left pretty full for 25 Euros! Glad you liked it! Read on your blog that you just moved to the ‘Dam. Cool! Hope you like it here and find some good food suggestions on dutchgrub!